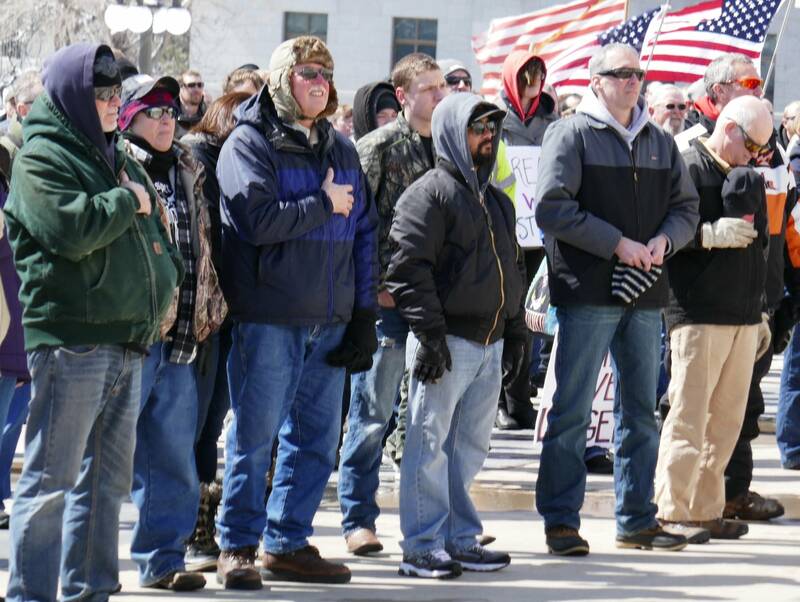 Several hundred gun rights supporters gathered at the Minnesota Capitol Saturday, a week after thousands of people turned out to push for restrictions on the sale of firearms. An organization called Minnesota Gun Rights hosted the event. A permit filed with the state said up to 400 people were expected, and it appeared about that many came to the Capitol grounds. Organizer Christopher Dorr told the crowd their Second Amendment rights are at risk because of recent gun control legislation introduced at the state and federal levels. "Gun owners like you and me and the tens of thousands friends and family who couldn't be here, we are getting trampled on. We're getting assaulted by the people in this building," Dorr said. "Gun owners are not respected. We're under full blown attack in this building." Last weekend, an estimated 20,000 people from the other side of the gun debate descended on the Capitol to press for more restrictions on firearms. It was part of the national March for Our Lives event. While political analysts say gun control measures are unlikely to make headway during the remaining six weeks of the legislative session, March for Our Lives organizer James Farnsworth said push back from the other side won't stop his group, Students Demand Action, from talking to lawmakers. "It is really about common sense gun safety legislation like universal background checks, which are supported by the overwhelming majority of Americans," Farnsworth said. Many at Saturday's rally, including Adam Engelsmeier, 25, of East Bethel, fear any additional restrictions on firearms could affect their personal safety. "The Second Amendment was written so people could have the same arms as the government, and in that fact it has already been infringed because I can't own an M4 or belt-fed machine gun," Engelsmeier said. Minnesota Gun Rights bills itself as the state's no-compromise gun organization. It is not affiliated with the Minnesota Gun Owners Caucus, which has had a steady lobbying presence at the state Capitol. That group is partnering with the National Rifle Association for a separate rally in late April.